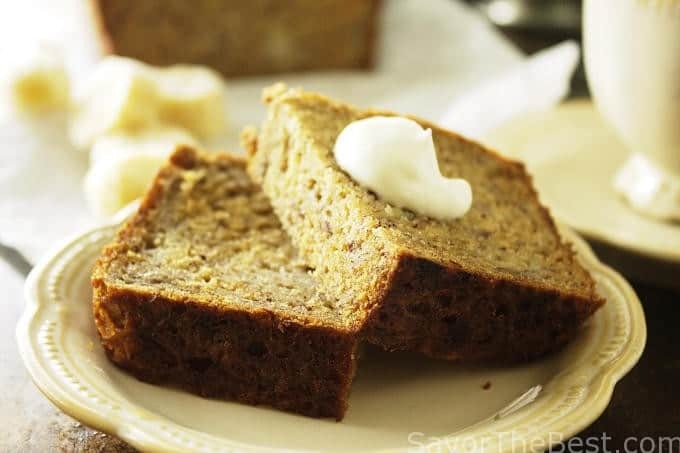 An easy and delicious banana bread recipe that does not skimp on banana flavor. 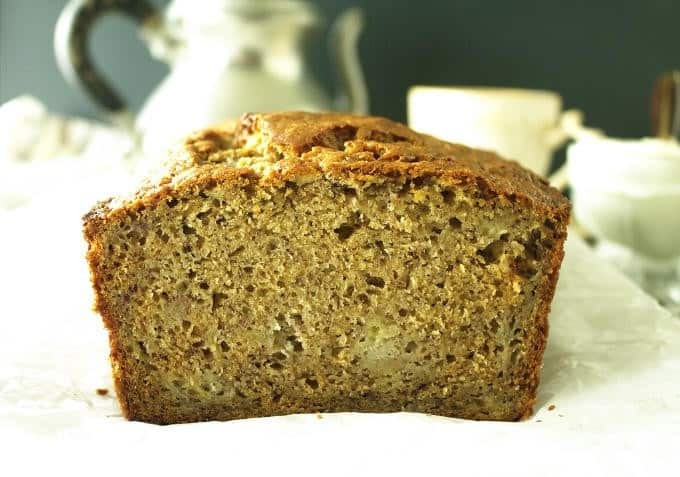 It is tender, moist, packed with bananas and easily the best banana bread I have made. Julia Child said “with enough butter, anything is good”. Butter adds flavor, depth and structure to baked goods. It’s hard to beat the flavor and imposters like margarine fall short. 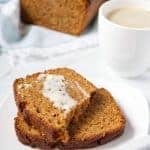 I can taste the difference in a quick bread that uses oil instead of butter but truthfully, oil creates a much moister, and less dense quick bread. However, unlike canola oil, olive oil can add a rich fruity, nutty flavor that compliments many baked goods. 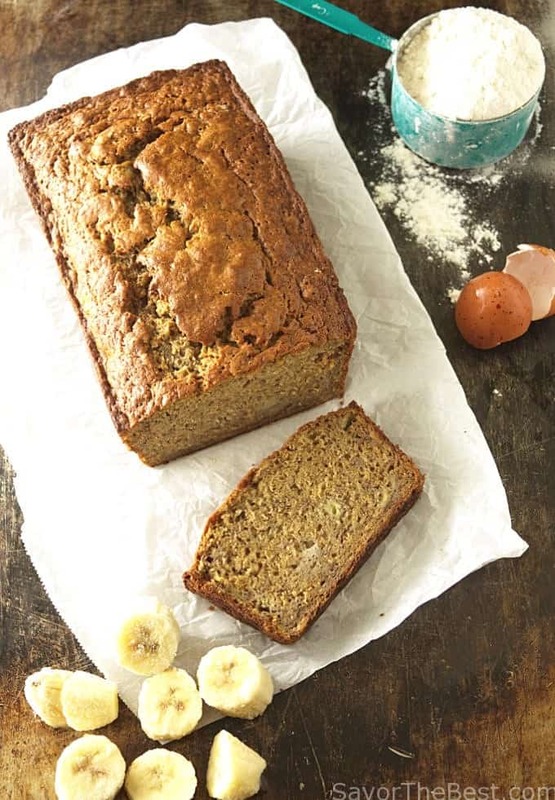 This recipe combines both butter and olive oil for deliciously moist banana bread. The key to using olive oil is to choose a light oil so you don’t overpower the bread. I like light Spanish olive oil for most baked goods, it has more fruity notes than Italian or Greek olive oils which tend to have herbal, grassy notes to them. 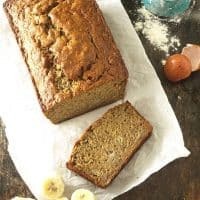 There are a lot of bananas in this banana bread and more is not always better as bananas add fiber which can create a tougher texture so the key here is to be extra gentle when mixing your ingredients (see my baking tip below). 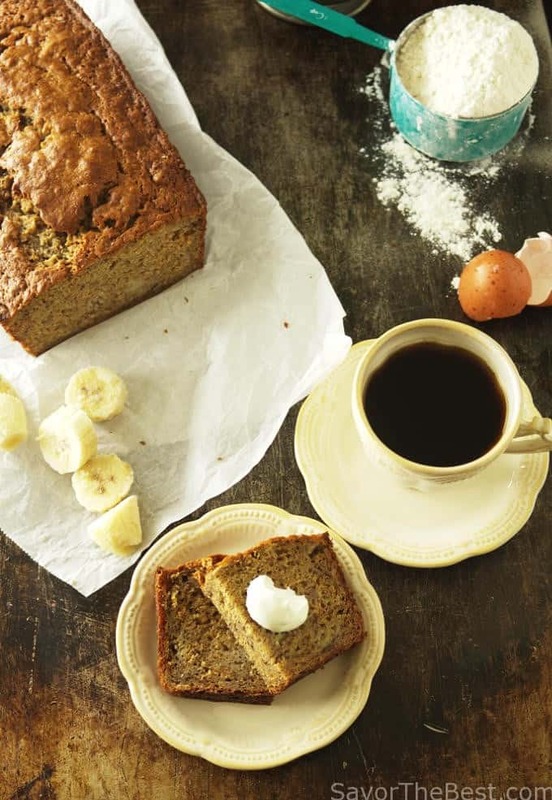 This banana bread recipe uses a two-bowl mixing method called the muffin method. 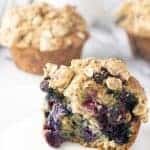 The muffin method is commonly used for pancakes, waffles, quick breads and of course muffins. It is easy, fast and creates a delightfully moist and tender texture that holds together well. 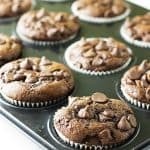 Although this method is easy, if you over-mix the batter it can create a tough texture. The key to success is to only mix the batter until the dry ingredients are moist and just barely combined. You want to see some lumps which will dissipate once it is baked. Start by combining all the dry ingredients in one bowl. Whisk or sift them together to get them evenly combined (you don’t want to bite into a “pocket” of baking soda). Next, stir together the liquid ingredients in a separate bowl then pour the liquids into the flour mixture and fold them together with a wide spoon or spatula. You should only use a few strokes to prevent over-mixing. It is good to have a lumpy batter. Do not use an electric mixer with this method. An electric mixer will over-work the batter and develop the gluten which will result in a tough texture. Preheat the oven to 350° and grease a 9­ by­5 ­inch loaf pan. In a medium bowl, whisk the wet ingredients together. Use a large spatula to gently fold the dry mixture into the wet ingredients until they are just combined. Pour the batter into the prepared loaf pan and bake for 55 to 65 minutes, or until a toothpick inserted in the center comes out clean. 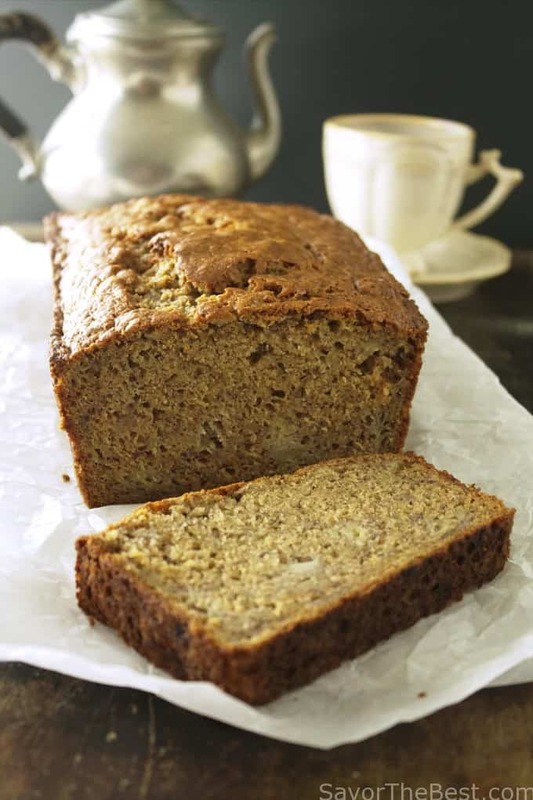 Let the banana bread cool in the pan for 20 minutes, then remove it from the pan and cool completely on a wire rack.